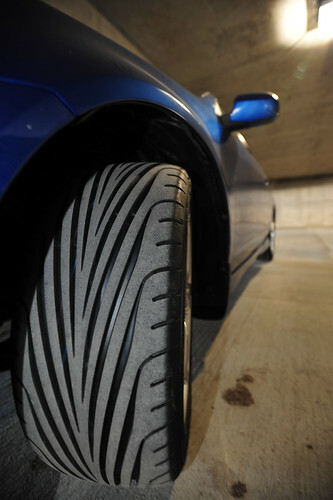 You Are Here: Home » Blog » car tires » How do you Rotate Car Tires? How do you Rotate Car Tires? Tire care just doesn’t seem to get the attention that it deserves these days compared to general engine maintenance. The rims and tires on car are equally important though. And yet; rotating a car’s tires is something many people rarely have performed, if they bother to do it at all. It’s shocking to hear how many people think that just driving a car rotates the tires by itself. Yes. It’s true that the tires are spinning whenever the car is in motion but rotating a car’s tires is something entirely different. Rotating a car’s tires is about changing out where each tire is located on the car itself such as swapping the left front tire with the right rear tire. Tires need to be rotated often because the front and rear tires of a car wear differently over time. Each tire on a car is put under a different amount of stress and serves a different purpose: since only the front tires of a car turn they wear faster than the rear tires, for instance. The life of a set of tires can be greatly extended by regular rotations and many tire warranties mandate rotations every 3,000 to 5,000 miles. You can elect to have your mechanic rotate your tires at every oil change or you can investing some time into learning how to rotate your own tires — a move that is guaranteed to save you some money; however, like any good investment you’re going to have to spend a little money first. Be prepared to lay down some money on a good torque wrench if you are serious about rotating your own tires. Even though all modern cars come equipped with a lug wrench for mounting a spare tire they are imprecise and are not designed for regular use. Ideally, lug wrenches should only really be used once or twice on a vehicle if necessary. Lug wrenches will get you of a quick jam if you need to replace a flat tire, but if you plan rotating your tires often then consider purchasing a torque wrench. A torque wrench will ensure that the tire bolts are properly tightened unlike lug wrenches which can easily strip tire bolts. You should also try to buy a floor jack to safely elevate your car. Just like a lug wrench, the jacks that come with vehicles should only be used in a limited capacity. A floor jack is intended for more everyday use and means that you rest easier when working under your car. Alright the first step that you will want to take when rotating your tires is to loosen the bolts or lug nuts on all of the wheels on the car. Don’t remove the bolts all the way though yet, instead only loosen them to the point where they can be easily taken off when ready. Next find the proper place to position the vehicle jack and raise your vehicle up so that the tire(s) can be removed. After the vehicle has been raised then remove the bolts from the wheel(s) and then remove the entire tire. At this point it’s best to remove one rear tire and one front tire if possible. Before you swap out the tires take a minute to examine each tire for wear. Primarily you’ll be looking for tread wear indicator, which are small raised bars of hard rubber in-between the spaces of the tire treads. If you can spot more three or more thread wear indicators on your tire then it’s time to replace that tire. Furthermore, look at the overall tread condition of each tire. If there is excessive wear on only one part of the tire then there may be a mechanical problem that needs to be fixed: improper alignment, for instance, can cause one-sided wear. If you vehicle is front-wheel drive then you will want to rotate your tires with the Forward Cross pattern. In the forward cross patter the front tires (L&R) move to the back of the vehicle and the rear tires are moved to the opposite position in the front: so the rear left tire would move to the front right. If your vehicle is rear or four-wheel drive then there are a few other patterns that you will want to follow instead like the Rearward Cross and the X-Cross Pattern. The Rearward Cross pattern has the rear tires moved to the front and the front tires moved to their opposite on the rear. The X-Cross Pattern involves moving the tires to their diagonal opposite. For different sized non-directional tires you would want to swap them from side to side. If you haves directional tires, like some all terrain tires, of the same size then you want use swap the left front tires with the back left tires and the right front tires with the right back tires. After you have mounted the tires thread the bolts or lug nuts back into place on each tire and lower the car back onto the ground with the jack. You can finish tightening up the bolts once the car is touch the ground to make it a bit easier. And that’s all there is to it. Compared to changing your own oil, rotating a car’s tires is relatively clean and does not leave you with any messy hazardous waste to dispose of afterwards. Rotating your own tires is an easy procedure that can save you at least $15 every 3,000 to 5,000 miles. By rotating your tires yourself not only will you learn a new skill and save money on rotations but you might just save your tires too.